To transform lives for better well-being through inspiration, self-love, and empowerment. The Body Beautiful by Allegra focuses on creating positive, realistic and healthy body images, by creating strong linkages between the mind, body and spirit to help create a “whole” person. Through a series of interactive workshops, participants learn to discover who they really are based on one’s own purpose of being and not society or media based standards. "What the mind is set to do, the body will follow, only if you are absolutely willing to meet the challenge head on by stepping outside of your comfort zone!" Allegra Feamster can be described as the 'cheerful taskmaster' when it comes to fitness and training. Her positive energy and contagious smile is what brings clients back - and keeps her classes full - and her drive and determination to keep them on track in achieving their goals is what moves them forward. With over 10 years of experience, she has taken the fitness and wellness world by storm serving as an international fitness presenter; appearing in fitness DVDs and working with leaders of the industry, such as, Donna Richardson-Joyner and Jorge Cruise; and being identified as a subject matter expert by media outlets including, NBC's In the Loop with ivillage, EBONY Magazine, Latina Magazine, Family Circle Magazine, NBC, Univision, Telemundo and Fox News. She has been featured regularly as a presenting Fitness Team member onboard the Tom Joyner Foundation's annual Fantastic Voyage Cruise; a team hand-selected by fitness guru Donna-Richardson-Joyner. 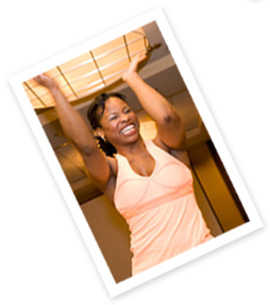 Allegra holds numerous fitness certifications, and teaches a variety of classes and workshops on healthy living. Although she enjoys teaching all formats, some of her favorites include: Cardio Kickboxing, Cardio Capoeira/Brazilian Groove, Zumba, Muscle Conditioning and Boot Camp formats. From the start of her journey as a Fitness Professional, Allegra would hear the whispers to excel in what started out as a way to stay in shape. Her Fitness Instructors encouraged her to teach, and, as an instructor, her students empowered her to step into personal training. Today, Allegra is a fitness and wellness powerhouse that has taken the encouragement and empowerment she received, and uses it motivate others. Allegra's program, The Body Beautiful by Allegra, focuses on creating positive, realistic and healthy body images, by creating strong linkages between the mind, body and spirit to help create a "whole" person. Allegra Feamster lives in Chicago. She speaks three languages, incorporating English, Spanish and Portuguese in her classes, and, to add to her professional repertoire, she serves as a store Ambassador for Lululemon Athletica - Oak Brook and is the National Fitness Expert for Girlfriends Health Guide for Women of Color. Allegra is a living, breathing product of what she teaches and preaches, "What the mind is set to do, the body will follow, only if you are absolutely willing to believe in yourself and meet the challenge head on by stepping outside of your comfort zone!" © 2010 Allegra Fitness LLC, All Rights Reserved.